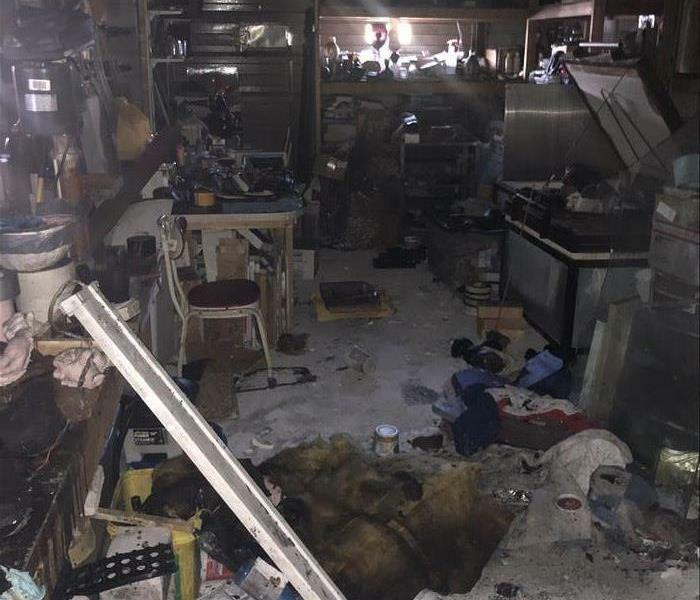 Once a fire has consume your home or a couple of offices within your business, the main question that comes to mind is that, "Who's cleaning up all this damage?" The option to clean up the mess yourself is always an option. Doing the job yourself will keep the cost down. Here at SERVPRO of Portsmouth, we are well trained with the latest techniques and are equipped with best equipment to get rid all of the smoke and soot that has damaged your home and/or business. We work closely with all the major insurance companies quickly and efficiently so we can get your home or business back to where it was prior to the unfortunate event. 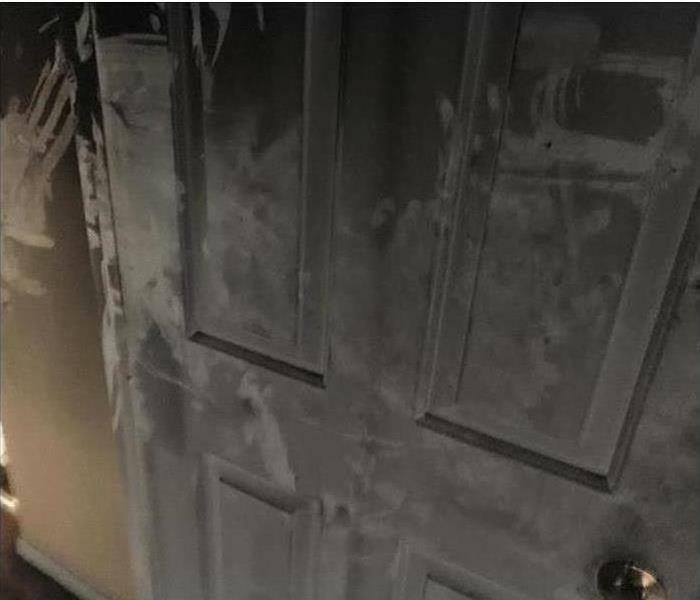 If a fire damage ever occurs, through faulty wiring or any flamable liquids next to a heat source, SERVPRO of Portsmouth is here 24/7 to make it look and feel "Like it never even happened." Your sump pump should be checked to see if its running properly at least once year. When it comes to storm seasons, several checks should be conducted. To test your sump pump, slowly fill the sump pump pit with water, watch the "float' to rise and then watch to make sure that the water level falls. It's free get your sump pump professionally tested and will cost for it to be installed. If you get the chance to fix a leak shortly after it started, there may be no long-term damage at all. However, if you have persistent leaks, it can lead to mold growth, termites, ants and more. To check for leaks, check dark spots under pipes, inside sink cabinets and stains on ceilings. If you have any questions/concerns, please call SERVPRO of Portsmouth at 757-397-3770. Our crew is certified and well trained to make it look and feel "Like it never even happened." This customer thought they could handle their water mitigation themselves, as a lot of people do. They soon found out why you should always call SERVPRO of Portsmouth just to be sure. 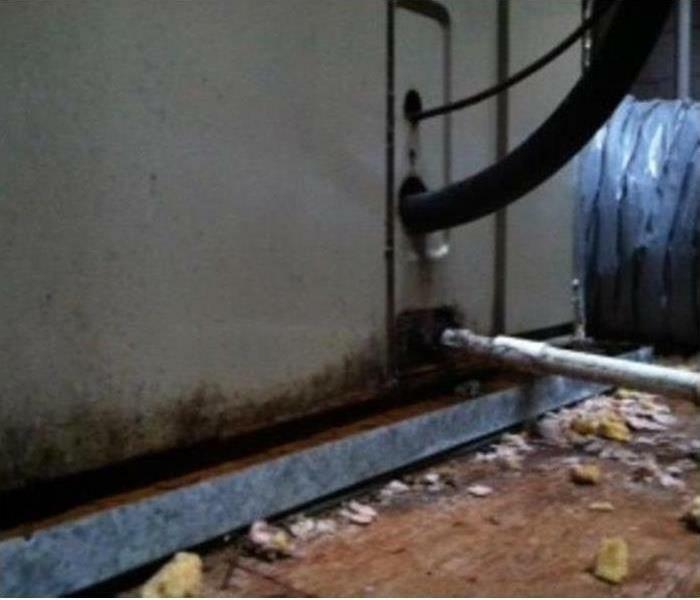 The customer started to notice a musty smell in the area where the water damage had occurred about two weeks later. They called SERVPRO of Portsmouth to take a look and we found high readings with our moisture meters on the base boards and walls of the affected area. We removed the base board do to the high readings and discovered mold on the base boards and the wall behind it. With the approval of the home owner, we performed mold remediation to clean the mold and high level of spores in the air. We use specialized equipment and an antimicrobial agent along with certified technicians to perform this remediation. 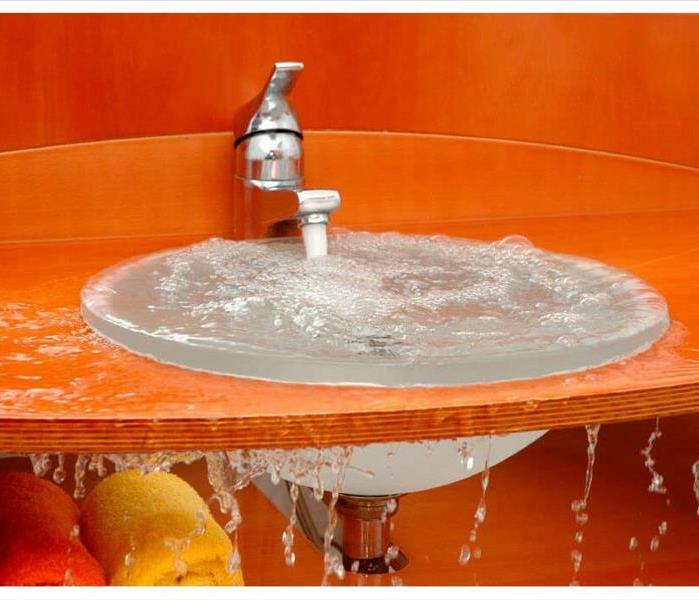 Hopefully you will never have a water damage, but if you do, don’t think it’s too small to call in the professionals at SERVPRO of Portsmouth to take a look at it. 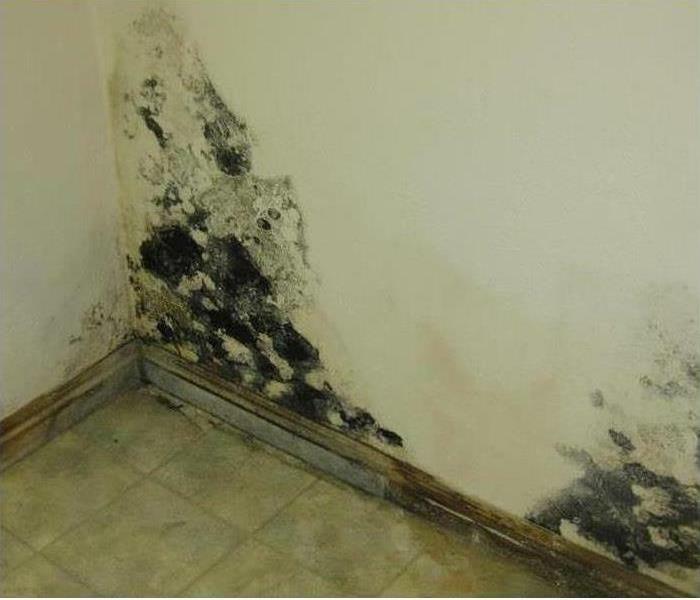 You would not want to end up with a mold issue like this that is easily prevented just by having us come take a look at the water damage as soon as possible. We provide free estimates and were willing to work with you schedule to provide minimal inconvenience. Please call us today if you have any questions or concerns. SERVPRO of Portsmouth can be reached at 757-397-3770. Here is a picture from one of our customers who didn’t know they had a mold problem until a nice day spring came and they went to open their window and found this. The mold in this home was the result of the very cold weather we experienced mixed with the warm temperatures inside of the home. This creates condensation, which is then trapped inside the window seal, eventually creating this mold buildup. This is more common than you would think and it often goes unnoticed. The weather the past few weeks has been especially erratic and has created a good opportunity for mold to find its way into many of the nooks and crannies of your home. The best thing that you can do is to make sure all of your seals on doors and windows are tight. Mold needs water to grow and spread so the first step to prevention is cutting off the water source. 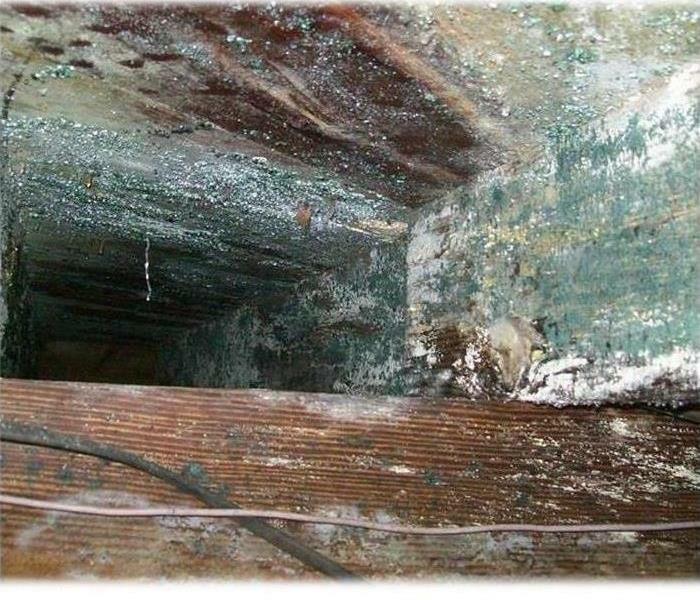 You might be thinking, “What should I do if I already have mold?” You should call SERVPRO of Portsmouth, we have technicians that are IICRC certified in mold remediation with years of experience. We also have specialized equipment that we use to filter the air and prevents the spreading of mold spores. So next time you come across an unknown substance that you think might be mold, you need to call SERVPRO of Portsmouth at 757-397-3770! This customer thought they could handle their water mitigation themselves. They soon found out why you should always call SERVPRO just to be sure. The customer started to notice a musty smell in the area where the water damage had occurred in about two weeks ago. They called us out to take a look and we found high readings with our moisture meters on the base boards and walls of the affected area. We removed the base board do to the high readings and discovered mold on the base boards and the wall behind it. With the approval of the home owner, we performed mold remediation to clean the mold and high level of spores in the air. We use specialized equipment and an antimicrobial agent along with certified technicians to perform this remediation. Call us here at SERVPRO of Portsmouth today at 757-397-3770 for help. 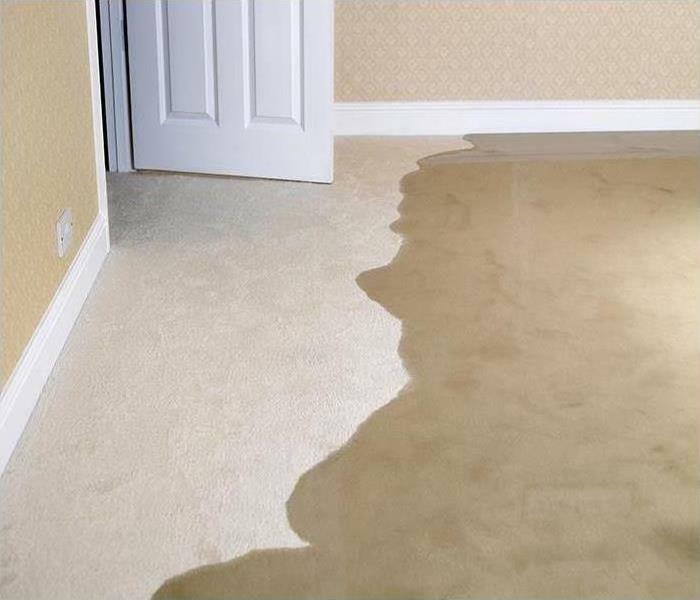 Water damage can happen at anytime of the day and anywhere. Example of water damages can be toilet clogs, dishwasher leaks and pipe burst and many others. When a disaster happens in your home, our team of warriors at SERVPRO of Portsmouth WILL walk through the disaster with you along with the drying process. At the end of the day, your home is the biggest purchase/investment ever. We are here to help you in a time of need when you need us the most and we understand the amount of stress that a loss can do to a person. Any type of disaster to your home can easily be the worst day of your life. If a tragedy ever happens to your home, whether its a basement flood, water heater burst or sewage backed up into your toiled, give our office a call at 757-397-3770. We are here to make and feel "Like it never even happened." If you have ever experienced a loss due to a fire, then you know the devastating effects it can have on your property and possessions. It is normal to feel overwhelmed and not know where to begin. But there are some steps you can take to help alleviate the situation from the beginning. SERVPRO of Portsmouth is here to help you in your time of need. First call SERVPRO of Portsmouth at 757-397-3770 and we will begin to help you with all the steps you need. Then call your insurance company, the sooner the better. They will send an adjuster to your property to assess the damage. Do not attempt to clean any of the damage yourself. Take plenty of pictures of the damage for your records. It is important to find a temporary housing situation, so you are not living among the smoke damage. Our trained professionals here at SERVPRO of Portsmouth are on call 24/7 to provide you with service, and answers to your questions and concerns. We will come up with a remediation plan, and provide a prompt estimate with no cost to you. 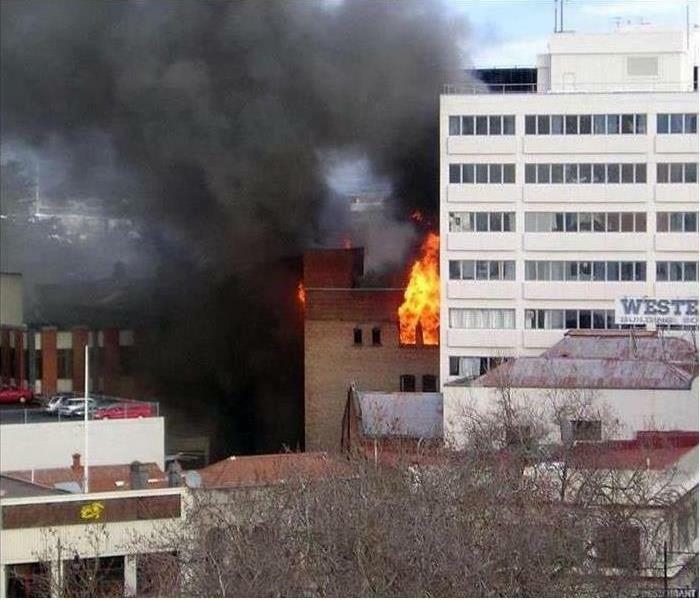 Here at SERVPRO of Portsmouth, we have assisted in both small and large commercial fires as well as residential fires. We know how important it is for our clients to get their homes and businesses back to normal, as efficiently as possible. If you or someone you know has been affected by a fire loss, call us at 757-397-3770. We pride ourselves in assisting you and your mitigation needs. After a fire, smoke damage can wreak havoc in your home or commercial property. 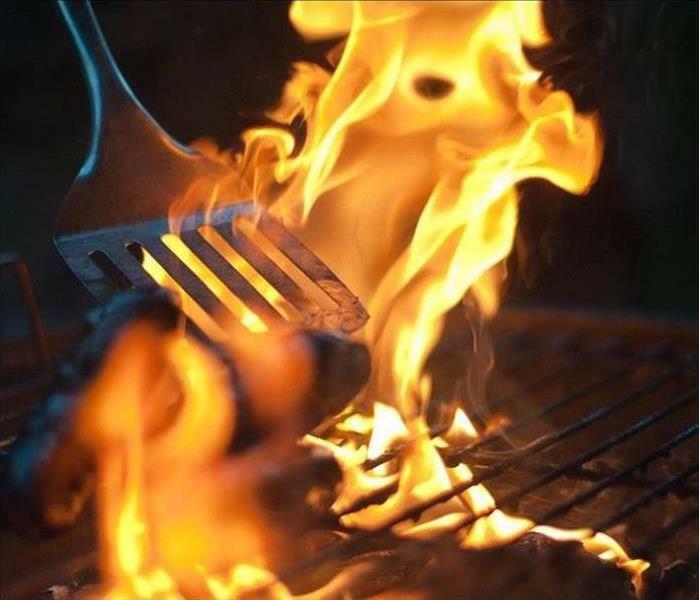 Kitchen flare-ups, closed fireplace flues, and electrical fires can send smoke throughout your house, charring walls, covering everything, and not to mention the smoky smell. The longer you let smoke and odors linger, the more they soak into walls, carpets, and furniture. Once the fire’s out or the flue is open, ventilate the house as quickly as possible to mitigate smoke damage. Open doors and windows, and turn off HVAC systems to avoid further spreading smoke. Call us, SERVPRO of Portsmouth! Let our professional and certified staff in Fire Restoration do the dirty work of ventilating, vacuuming, and deep cleaning. Call Us Today – 757-397-3770n or check us out online at SERVPRO of Portsmouth. Living in a high-rise building can protect you from a handful of different disasters. Unfortunately, they don’t make you any less at risk from a fire. Although high rise buildings are more likely to have fire protection systems in place, they face additional challenges that low-rise buildings may not. Complex evacuation strategies, limited fire department accessibility, smoke movement, fire control, and longer egress times and distance are just some of the unique challenges that these buildings may face in the event of a fire. The multiple floors of a high-rise building create the cumulative effect of requiring great numbers of persons to travel great vertical distances on stairs in order to evacuate the building. People working or residing in high-rise apartment, condominium, and office buildings need to be fully prepared in the event of a fire. Be sure that you are working closely with your neighbors, landlord and co-workers to ensure everyone is aware of the proper fire safety procedures and features in your building in the event of a fire. Due to the humid weather lately, Hampton roads has experienced many severe thunderstorms. This has, in turn, caused both residential homes as well as commercial business to experience outages. 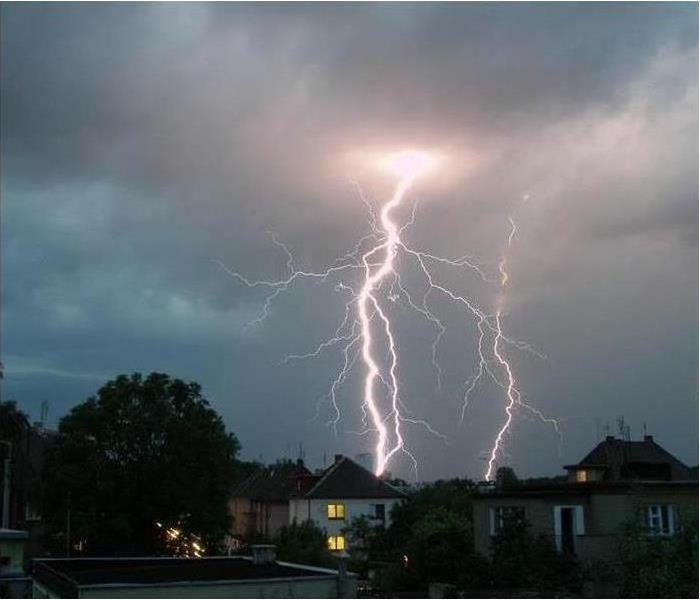 Thousands were without power in Virginia Beach on the night of July 15, 2015 after a severe thunderstorm warning was issued for some areas on the Southside. According to Dominion Virginia Power, more than 2,000 customers in Virginia Beach experienced a power outage. Just after midnight, that number had been reduced to about 1,500 customers and the estimated restoration time was 3 a.m. Here are some tips that will prove to be helpful if a power outage looks likely. •Follow energy conservation measures to keep the use of electricity as low as possible, which can help power companies avoid imposing rolling power outages. •Fill plastic containers with water and place them in the refrigerator and freezer if there's room. Leave about an inch of space inside each one, because water expands as it freezes. This chilled or frozen water will help keep food cold during a temporary power outage, by displacing air that can warm up quickly with water or ice that keeps cold for several hours without additional refrigeration. •Be aware that most medication that requires refrigeration can be kept in a closed refrigerator for several hours without a problem. If unsure, check with your physician or pharmacist. •Keep your car tank at least half full because gas stations rely on electricity to power their pumps. •Know where the manual release lever of your electric garage door opener is located and how to operate it. Garage doors can be heavy, so know that you may need help to lift it. •Keep a key to your house with you if you regularly use the garage as the primary means of entering your home, in case the garage door will not open. Always remember SERVPRO of Portsmouth is here to help by calling 757-397-3770.